Marcos Bish recently visited the University of Wollongong in Dubai (UOWD) and provided a guest lecture to a cohort of ethics students on Corporate Social Responsibility (CSR). The lecture was organised by Dr Zeenath Reza Khan, Assistant Professor at UOWD in collaboration with Centre for Responsible Business, Dubai Chamber of Commerce. During his lecture, Marcos focused on the components of CSR from a corporate perspective, highlighting what it entails and how companies are integrating CSR as part of their strategic plan. 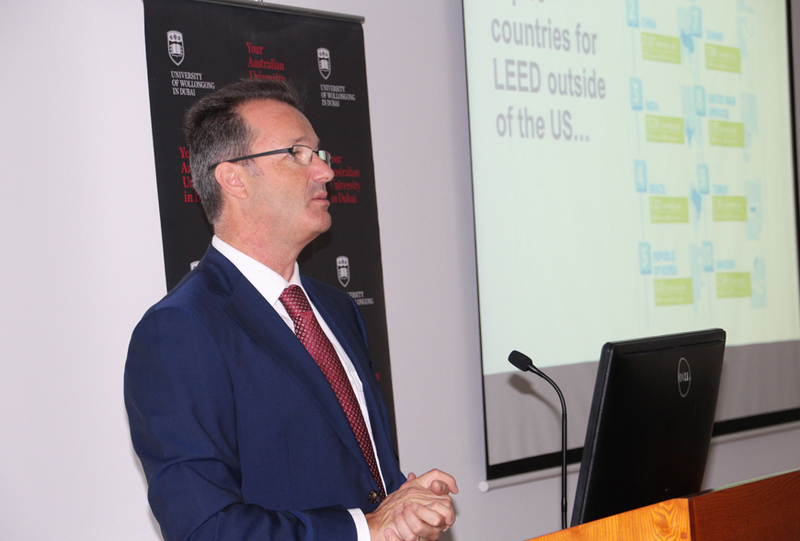 During his talk he focussed intensively on sustainability, its meaning and its impact on a company. He also discussed how companies are using LEED certification to evaluate the environmental performance of a building and encourage market transformation towards sustainable design, and the trends that we are seeing in the market today as companies are expected to support the Government’s initiatives to reach its clean energy targets. Sharing insight on leading sustainability examples both locally and globally, Marcos demonstrated to the students the successes and failures of organisations in their bid to become more sustainable, evaluating the impact that CSR has not just for the environment, but across the workplace and in the communities in which they operate. “Corporate Social Responsibility is a journey, not a project. Every company’s journey is different and through trial and error, they find their way to be efficient and successful”, he concluded. Summertown look forward to continuing to support the students in their learning, and to hosting a session in the coming weeks at their HQ in Jebel Ali. Photograph – courtesy of University of Wollongong, Dubai.